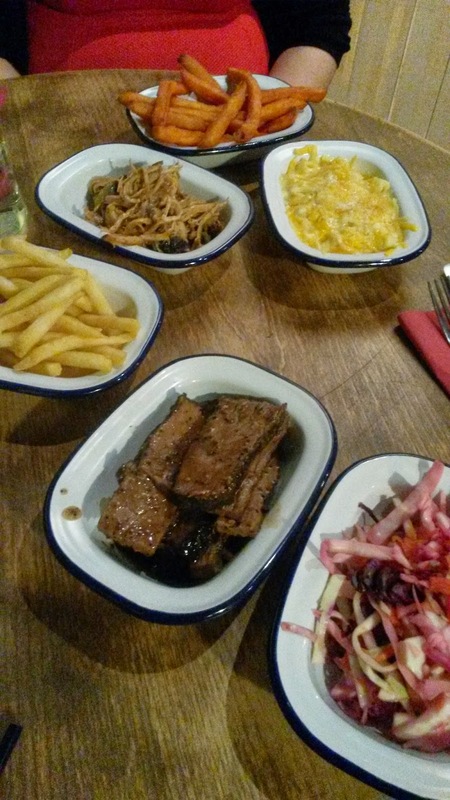 Having watched a significant amount of Food Network classics like Man V Food and Diners, Drive-In's and Dives recently the knowledge of the arrival of Jim's Smokehouse in Nottingham came at a pretty good time for us after having our appetite wet. Situated along the main street through Hockley on Goose Gate, It's a little out of the way of the main daytime city centre footfall and with the Hockley area seemingly not it's previous dominant centre for Nottingham's bar culture it does make you question the logic of starting up a new venture in such a location until you stumble across the information that it's the new brainchild of Red Hot Buffet Shack and Rakono on the previous premises. Having never been to either of these places over the years I was able to eat without any preconceptions of what the previous establishments offered. Having imported an authentic smoker from the USA we were rather intrigued at what would be offered and whether we would have our own Man V Food challenge when the other half and I met up after she'd finished work feeling a little peckish on a Saturday evening. With a very meat orientated menu we opted for the the BBQ Combo (£14.95) from the menu which was our choice of two barbecue options from the Low 'N' Slow BBQ side of the menu. We opted for the Carolina Pulled Pork and Texas Beef Brisket which came alongside a portion of fries and homemade slaw. To make this more of a meal for two we added a portion of Mac 'N' Cheese and Sweet Potato Fries (£2 each). The meal itself came out nicely presented in little dishes which to us meant we could easily separate it between our plates for sampling when splitting onto plates. That saves the usual, "If we eat half of what's on the plate/in the bowl and then swap" technique we have always gone with ever since we started dating. Having recently tried some fantastic to rather mediocre attempts at pulled pork I would have expected an American style smokehouse to have some melt in the mouth offering but the pulled pork at Jim's Smokehouse was very dry and somewhat hard work. There was certainly very little smokey taste and in honesty it felt a real let-down compared to my expectations. The Texas Beef Brisket was a little better, much more succulent and moist although not quite melt in the mouth soft. There was a little chew to it to make you know you're eating instead of placing Skips in your mouth but the real let down was the gravy. Definitely no real hint of barbecue and more of a crust on the edge of the meat than an actual sauce. The sauces at Jim's Smokehouse really left me feeling let down. From the 'gravy' on my beef brisket to the selection on the table which were exceptionally watery as though the restaurant had run out previously and just topped up the sauces with tap water. There was a little flavour to them but no real kick like their label suggested. The only real highlight was the amazing sweet potato chips which came out piping hot with fluffy insides and beautifully crisp outsides which really put their regular fries to shame. Would we go back to Jim's Smokehouse? In honesty not unless someone had already arranged an office or family meal there. The food was acceptable if any thing short of inspiring considering how good the menu looked. We're sure it could be done a lot better and that's where the real let down lies.